Former Patriots offensive lineman Matt Light. GREENVILLE, Ohio — With beads of sweat of dripping from his hairline and his thin-wired glasses fogging up, a young man toils away with a sledgehammer in July’s unforgiving midday heat. Surrounded by cornfields as far as the eye can see, he lifts the hammer above his shoulders and slams it down on a small piece of raw timber. Exhausted, he drops his shoulders after 10 minutes of constant bashing and locks eyes with his ever-watchful teacher. He adjusts his grip and unleashes 22 more thwacks, pounding the wood until a piece breaks off and falls to the dirt. Mission accomplished, he mic-drops the sledgehammer and gives his teacher a high-five. The gesture, however commonplace, says everything about the unlikely bond between Luis Matos, a 17-year-old former gang member from Worcester, Mass., and Matt Light, the former offensive lineman for the New England Patriots. When Light retired from the NFL in 2011, his hometown wanted to host a Matt Light Day and put his name on all the signs at the edge of town. “Matt freaked out,” his wife, Susie, says. “He said absolutely not. That’s just not him.” Light instead honored his roots by purchasing a few downtown properties (he’s a coffee house landlord) and 600 acres of farmland in Greenville, where he grew up riding tractors, hunting turkeys and fishing in the streams. Matt Light’s mother-in-law, Mimi, prepares breakfast for the campers. 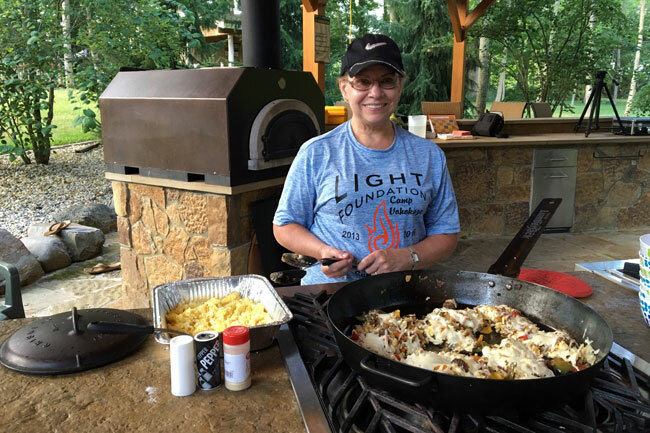 Light’s four children mingle among the campers; his mother and mother-in-law take off work to cook meals (like four dozen cheesy skillet eggs for breakfast). Greenville pitches in too. For the camper’s annual pizza-making challenge, the local pizzeria donates the dough and sauce while the owner serves as the judge. Each night ends with a fireside chat, where the teens are encouraged to speak openly and honestly about their lives. Four years ago the Light Foundation brought in a group of freshmen from Worcester, Mass. Among them was a shy kid with a big smile who longed to be a part of … something. Forty miles west of Boston, Worcester is at first blush an inviting red-brick city, New England to its core. It’s home to several colleges and universities, several hospitals and Polar Beverages, which has an inflatable polar bear sitting on a warehouse rooftop and waving to cars on I-290. But there’s also a hardscrabble side. A 2013 cover story in Worcester Magazine quoted the police chief saying there were 16 known gangs in the city of 180,000. National statistics suggest most members join before they turn 15. When the local Boys & Girls Club referred Luis to Light’s foundation in January 2013, Maritza was ecstatic. “It felt like someone was looking after my boy,” she says. Luis loved his first summer in Greenville. “I was doing fun things I never thought I’d do in my life, and I met some cool people,” he says. When they volunteered at the local church festival, the counselors received more compliments about him than any other camper. During Luis’s 2015 summer trip to Greenville, Light had several long discussions with the troubled teen. They went on long walks together, but Luis either wouldn’t listen or kept talking back. So Light toughened his approach. “You’re going to waste your life away,” he said. Within 24 hours of returning home at the end of camp, Luis snuck out of the house via a third-story window. For 30 days he lived on the streets, sleeping at friends’ houses, at houses of fellow gang members, or in unlocked cars parked on the street. Picked up by police along with another teen, Luis was arrested on a weapons charge. The other teenager, who was let go, ended up getting shot later that day. “The minute I find out about this, I’m calling every place in the country that takes kids like this who have screwed up,” says Light, who was in contact with Luis’s case officer from the department of youth services. “Let me fulfill my commitment to this kid,” Light pleaded. Two days before Luis’s court hearing, Maritza awoke to a heartbreaking call. Her other son, Reynaldo, had been found dead on a park bench in Worcester Commons. He overdosed on heroin. He was 24. At least one person in the courtroom wasn’t impressed. Light spoke to the judge and explained how he’d found a diversion program in Storm Ridge, Utah, that would accept Luis and put him to work on a ranch in a yearlong program designed to get kids back on track. According to Light, the judge said, I like you, and I like that there is an organization doing this. I am willing to put him in your custody, but he has to agree to it. If not, I’m giving him a year-and-a-half sentence. The judge told Luis, You have somebody going to bat for you, but this is on you. Let the record show it is you who has to make the decision. Luis finally nodded. He was on a plane to Utah the next day. Luis Matos at a camp event, and working the sledgehammer under the watchful eyes of Matt Light (hands on hips). Luis lived in Utah from September 2015 to June 2016 and earned his high school diploma a year ahead of schedule. When Light and Schuckman visited last winter, Luis showed them how he was able to ride horses and corral cows. He’d also begun lifting weights and decided on a career path: He wanted to work with the elderly. 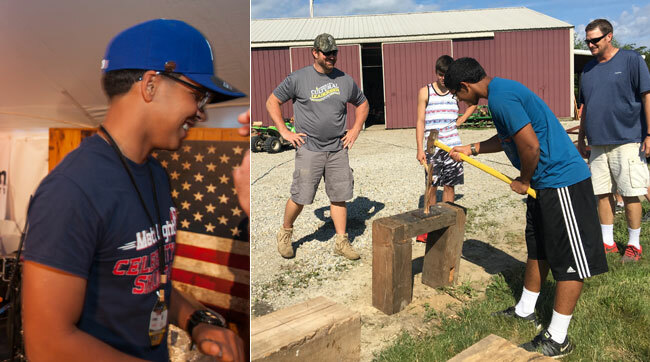 After the Storm Ridge program, Luis flew straight to Greenville for his last summer as a camper. One day, the campers were tasked with using a sledgehammer to pound raw pieces of wood through a small hole and transforming them into pegs that would be used in a new fence. “Not until you finish,” Light told his ultimate work-in-progress. Luis thwacked the sledgehammer a few more times until an unrefined piece of wood had been transformed into a smooth peg. As he dropped it in a nearby bucket, he noticed one of the younger campers struggling with the hammer.